Each draft season too many managers behave like broken records, playing the same notes over and over again, trusting a player’s fantasy points from the previous season to be there again. That results in drafting without proper context. There are various ways to seek context in fantasy prognostication: Targets, fantasy points per touch, yards per attempt, etc. In this article, we’ll attempt to not just use success from one previous fantasy season alone as a barometer for future success, but to uncover exactly how often success in previous seasons has translated to success after that. Specifically, we’ll cover top-12 quarterbacks and PPR tight ends. Last season was the first time in the high-volume passing era that at least half of the top-12 quarterbacks from the previous season did not repeat as top-12 quarterbacks (using standard scoring settings of 0.25 points per passing yard, 4 points per passing touchdown, and -2 points for interceptions). However, top-12 quarterbacks over the past five seasons have had a significantly higher success rate in repeated success than other positions. This likely is not enough information to form a draft strategy for quarterbacks, though, as top signal-callers from the previous season will cost you a top-50 pick; whereas, others can be had as late as the double-digit rounds. Let’s dive deeper into the quarterback position though to see if we can come up with some educated opinions on when to select one. In every season since 2011, at least half of the top-six quarterbacks finished as a top-12 quarterback the following season. However, that was also the case in four of the past six seasons for the QB7–12 grouping. To me, the table above shows that top-six quarterbacks aren’t significantly more likely to finish as top-12 QBs the next season when compared to the QB7–QB12 grouping. Frankly, I expected a far higher success rate for top-six scoring QBs than what I found, considering we are living in the golden age of passing in the NFL, with many future Hall of Famers at the position. In my opinion, if less than 60 percent of the previous year’s top-six quarterbacks are going to finish as a top-12 QB, it’s hard for me to justify spending a high pick on one. Which one of these is not like the other? Alex Smith is getting zero respect in fantasy drafts after finishing fourth at the position last season. Our own Denny Carter believes Smith is once again a target for late-round quarterback lovers seeking production on the cheap, due to the high-volume potential under Jay Gruden. However, if your draft strategy is to select a quarterback early, there are two names who appear to be extremely safe investments. Drew Brees and Russell Wilson have been QB1s in each of the past five seasons. Wilson is being selected in the fourth or fifth round, but Brees is coming at a discount, despite still finishing as the QB9 last year and no worse than QB6 in the six years prior to 2017. Brees can currently be had in the sixth or seventh round. 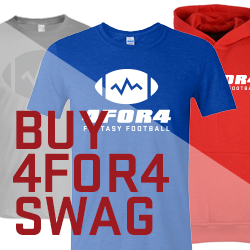 However, Matthew Stafford is coming at an even bigger discount in the ninth round. He’s been a QB1 in four of the past five years and top-10 in three consecutive seasons. Philip Rivers should also receive some attention here, with four top-12 QB seasons in the past five years. He can be had for even cheaper in the double-digit rounds. The position saw a significant spike in year-to-year consistency when seven of 12 repeated from 2013’s top finishers. Like quarterbacks, tight ends have been more consistent year-to-year than running backs and wide receivers. However, like the quarterback position, which most leagues only require one to start, more context is required to develop a draft strategy around when to select a tight end. Over the past six seasons, the top-six tight ends were significantly more consistent than the TE7–TE12 grouping in repeating the following season as a top-12 TE. The 22 percent difference in success rate is four times as large as the difference between QB1–QB6 and QB7–QB12 repeating (shown earlier). Specifically, which tight ends have been most consistent year-to-year? Three of these TEs are not active (Witten, Gates, and Bennett). Delanie Walker’s consistency has been marvelous, as he’s also finished as a top-five PPR TE in three straight seasons. He also has the cheapest ADP of the remaining names in this table, being selected in the sixth round or later; whereas, Rob Gronkowski and Travis Kelce will cost you a pick in the first two or three rounds, with Greg Olsen usually being selected in the fifth round. Looking deeper at the TE7–TE12 scorers over the past six seasons, the success rate of repeating is too low for me to risk using a pick on one of them. Those TEs last season were Jack Doyle, Kyle Rudolph, Jason Witten (retired), Cameron Brate, Ben Watson, and Jared Cook. With a low 33 percent success rate to repeat as a top-12 TE, I’m waiting until the double-digit rounds to take a chance on one with upside if I can't land an elite tight end. Some names that stand out to me in that area this year are George Kittle and Tyler Eifert. Trey Burton is another target if he's available late, and on some sites he is. Top-12 Quarterbacks and PPR tight ends are more consistent year-to-year than top-12 PPR running backs and wide receivers. QB1–QB6 tier is not significantly more consistent than the QB7–QB12 tier since 2011. Drew Brees in the seventh round is likely the earliest I would pull the trigger on a quarterback. However, given the data, it's more likely that I wait until the double-digit rounds to select a signal-caller. If you’re looking for a repeat performance from a tight end, the TE1–TE6 tier is 22 percent more likely to repeat as a top-12 scorer than the TE7–TE12 tier. Shoot your shot with Gronkowski, Kelce, or Ertz, or wait until the double-digit rounds to take a flier on one with upside. Photo by Mitchell Leff/Getty Images. Trey Burton the Next Travis Kelce?